The digital non-contract infrared thermometer is a reliable device used to measure the surface temperature of an object. Wide temperature measurement range makes it applicable for installation and commissioning of HVAC systems, hot, hazardous or hard-to-reach objects. 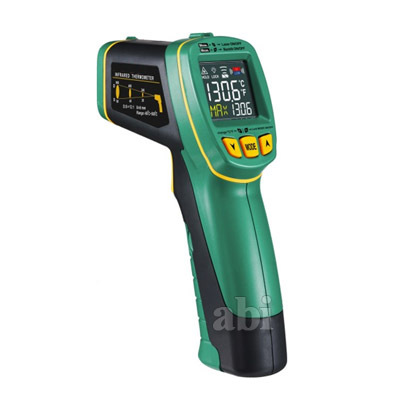 - Professional infrared thermometer for measuring the surface temperature of an object. which is safe to use. - Optional temperature units: Celsius(°C) and Farenheit(°F). - Can set high temperature and low temperature alarm. - Digital LCD color display, convenient to read at night. - Low battery indication and automatically power off. - Operating environment: 0 ~ 50 °C (32 ~ 122 °F), 0 ~ 90% R.H.
- Storage environment: -10 ~ 60 °C (14 ~ 140 °F), 0 ~ 80% R.H.